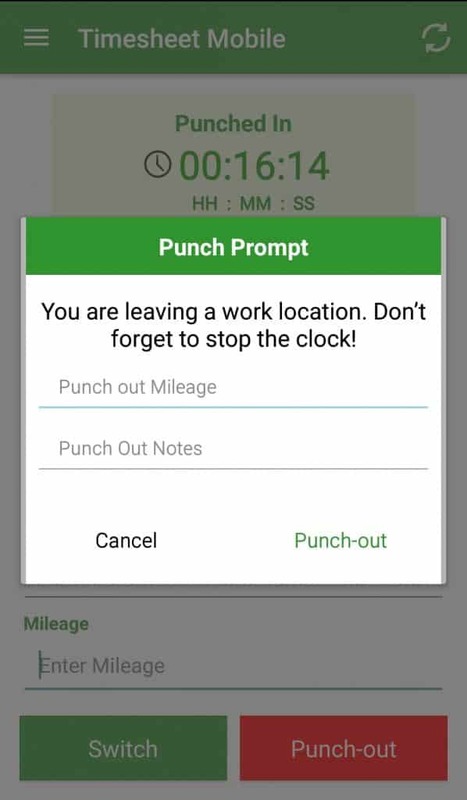 With Geofence Autopunch built into our Timesheet App, employees can be punched in and out of jobsites as they enter and exit geofenced jobsites during their scheduled hours. Getting accurate timesheets with shift times and travel is that easy! Employees install the free app and go to work!! Drag and drop to easily schedule by jobs or employee. Instant notifications are sent to employees when there is a schedule change. Detailed and accurate real time reports for quick payroll processing and job labor costing. Employee and manager timesheet approvals. No more manual timesheets! Create checklists that workers check off during the shift. 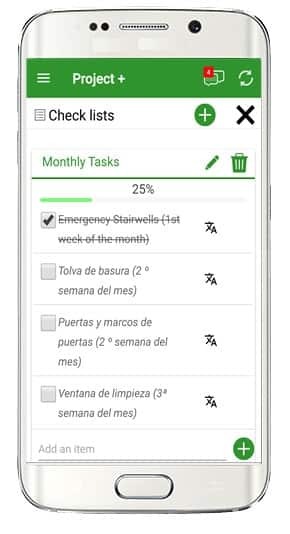 Get instant alerts when a task is completed and ensure the work gets done. 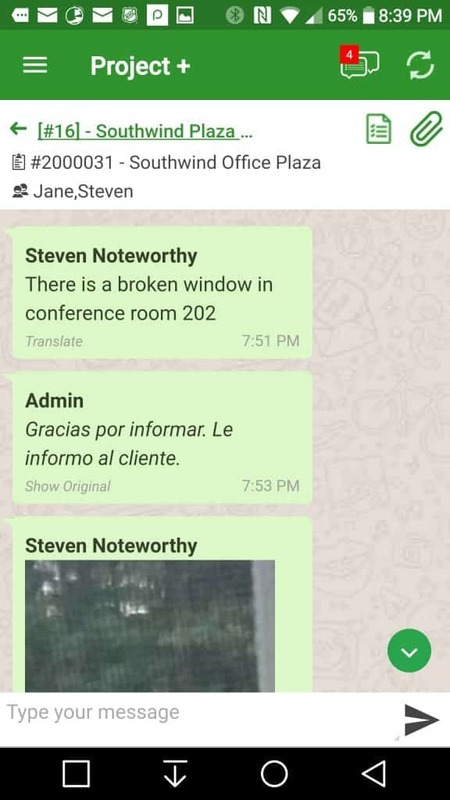 Teams can discuss urgent priorities, chat in four languages, upload images from job sites, attach specifications and clarify instructions from the office. 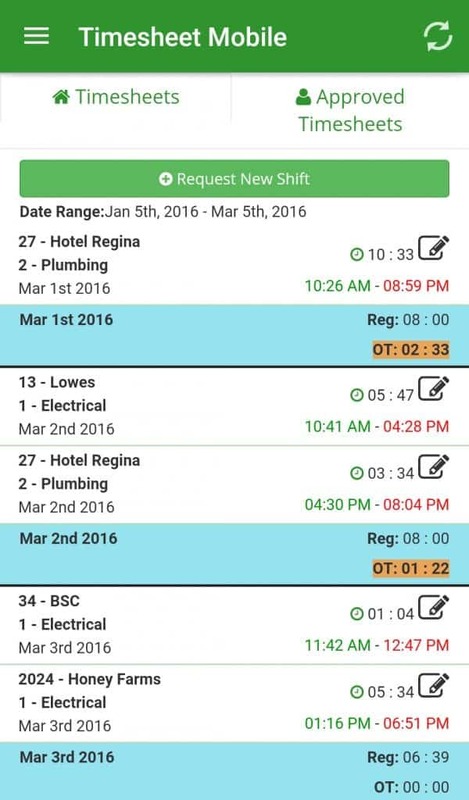 Real time manager alerts when overtime approaches, Geofence Violations, Punch Prompts, or Late for Scheduled Shift. Easily schedule time off and view holiday, sick, and vacation reports. Eliminate paper timesheets, set up employee jobs, assign tasks and manage employee schedules. Simplify payroll with easy software integrations. Access messaging and file-sharing tools for total project management – all in one cost-effective monthly subscription. 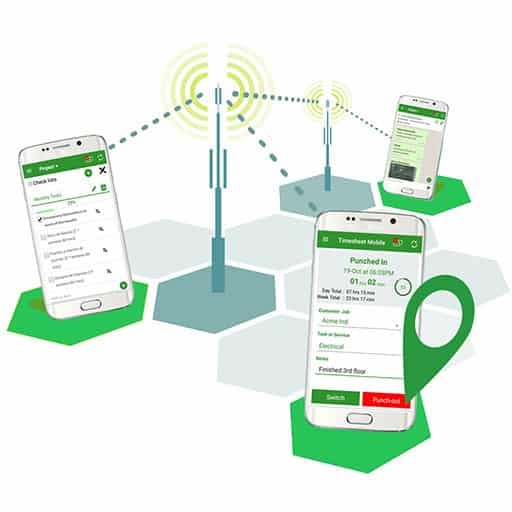 Keep track of your on the clock mobile employees with best-in-class GPS geofencing technology and receive instant alerts when workers are away from the job site. 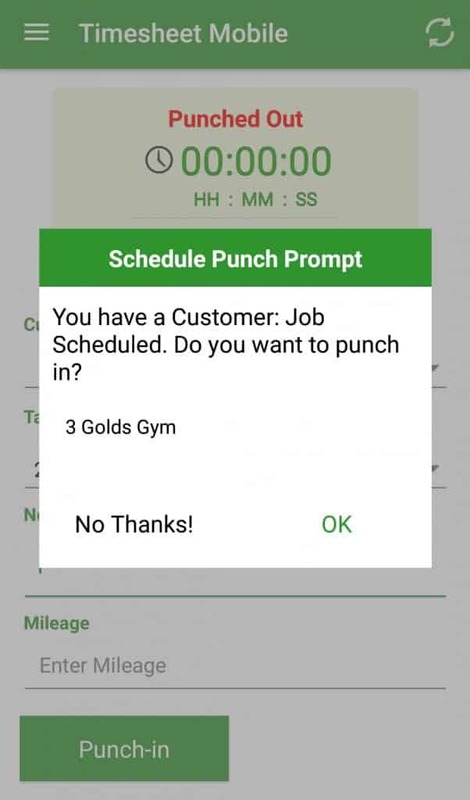 Our timesheet app reminds employees to punch in and punch out, allows them to approve their online timesheets and seamlessly collaborate with their teams while on the job. 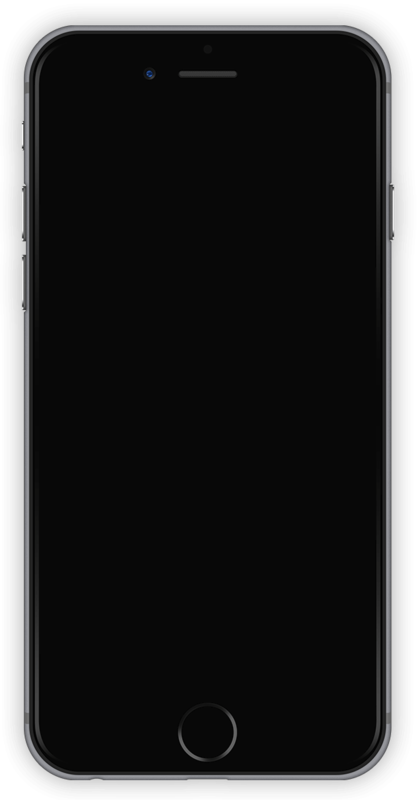 Set up single or recurring shifts and remind employees – via their smartphone – when shifts begin and end. If workers miss a scheduled punch in or punch out time, managers will get an email alert. 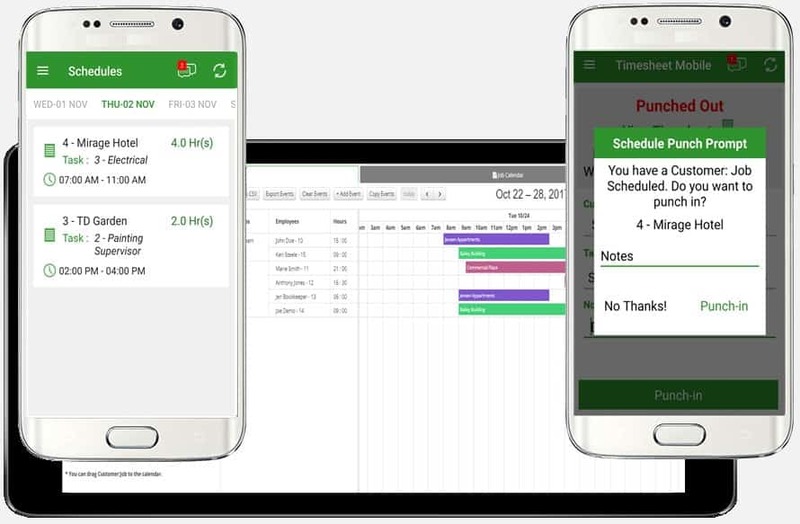 A smart feature included for free with your Timesheet App. 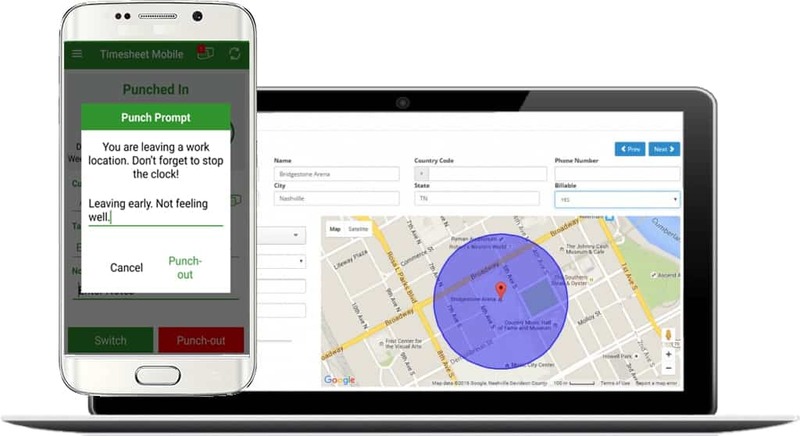 For mobile workers, our timesheet app allows instant access to customizable job site geofencing capability. 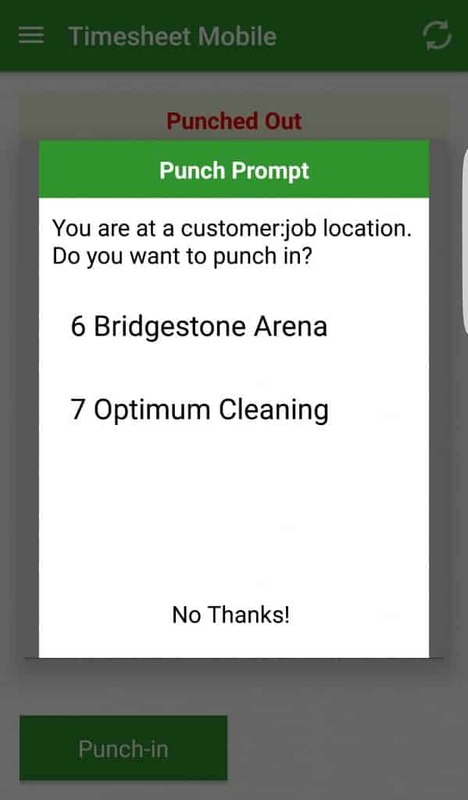 iPhone and Android users receive exclusive Punch Prompt reminders to punch in and out, and managers are notified when punches take place outside geofenced areas. Timestamps of their departure times are recorded in the activity log. Punch Prompts prevent errors and eliminate wasted admin time fixing timesheets. No signal? No problem. Our reliable cloud-based service works just as well in offline mode. 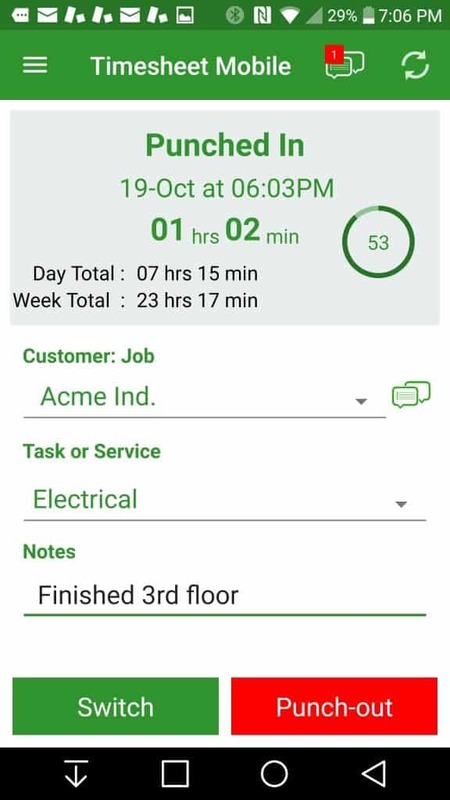 For office workers and those that report to the same work location, our Kiosk is a quick and easy way to log their hours using an on site computer, tablet or smartphone. 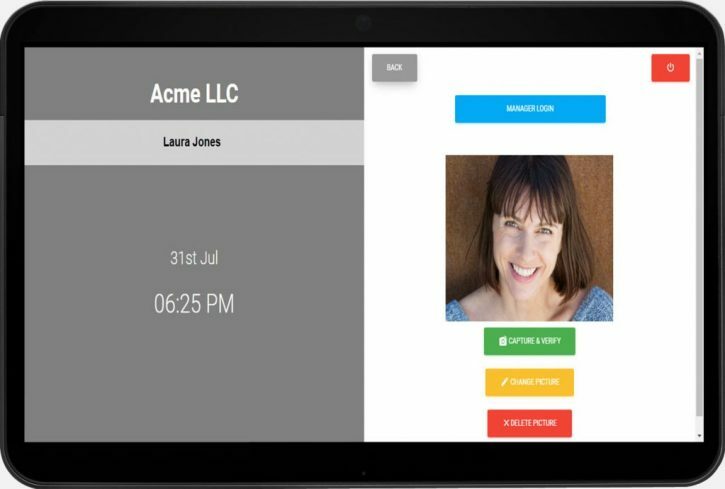 Using facial recognition technology, our app uses the front facing camera to verify the employee and allow them to Punch in and out. 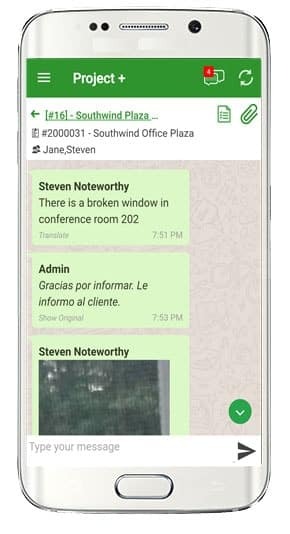 With our real-time platform for team messaging, checklist creation, specification and image sharing, teams can quickly exchange information without having to make calls, exchange emails and reply to excessive texts. Instant translation in English, French, Spanish and German ensures swift communication and less confusion. 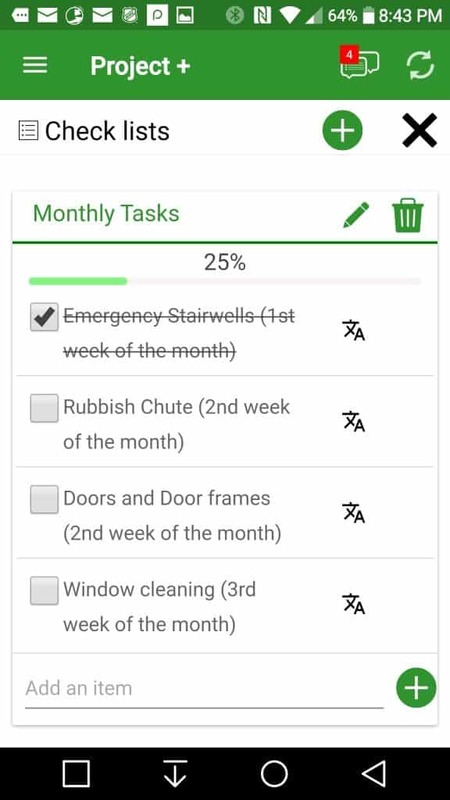 Project+ is built into the timesheet app and automatically stores checklists and messages into each project, customers and job. 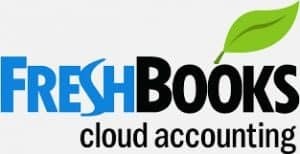 Using Quickbooks, Xero or FreshBooks? Your job just got a little easier! Timesheet Mobile easily integrates with your QuickBooks Online, Quickbooks Desktop, Accounting Suite, Xero or FreshBooks account. With a couple of clicks, upload employee timesheets for easy payroll, customer invoicing and job costing. Automatically syncs. your employees, clients, customers, projects and tasks all in one place. You can also export timesheet files compatible with ADP and Sage. We offer a generous Partner Program to Bookkeepers and Accountants who resell our employee time tracking solution to their clients. 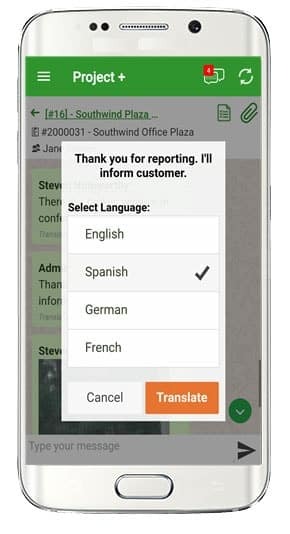 With Timesheet Mobile’s Integrated Voice Response (IVR) system, available in any language, employees dial a toll-free number and follow the voice prompts to punch in and out, as well as enter their customer and job information. IVR service can also be used from landlines. We are saving $400 to $500 DAILY on wages! Also, knowing that there is GPS within the timesheet app and the guys have to be clocking in when they approach the geofence of their job – or I’m going to question it – that's made everyone a little more honest. We've realized that investing a mobile timekeeping system is TOTALLY worth it. You make the cost back almost immediately. Pays for itself. And it's helped us significantly cut payroll costs – by over 25 percent – HUGE! Do the 30 day free trial. That hooked us. It’s full featured. We had access to everything. Once we spent the time building the platform and getting all the data in there, that was it. We weren't turning back. "I have been working with Timesheet Mobile for over a year now. I have been able to provide my clients with a solution to their business that helps them grow and have piece of mind when it comes to their employee time tracking. The most important component to my clients was also the ability to Job cost their projects. Timesheet Mobile made that possible. What I also like is that Timesheet Mobile's support team is very responsive and stand by their product."